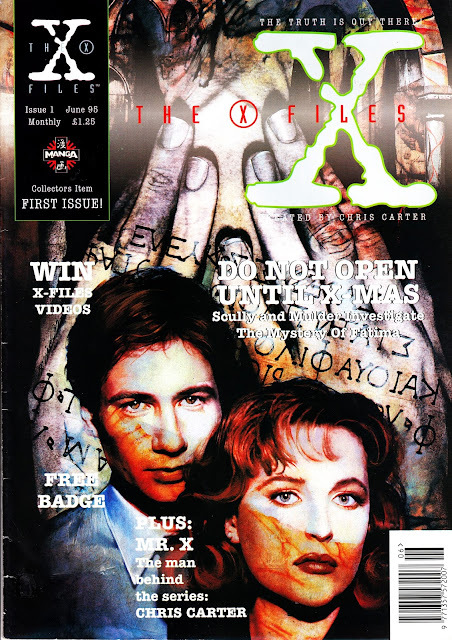 From 1995: THE X-FILES Issue 1 "X-Files Bureaus Special Collectors Edition". Not another double post?!? Nope! It's another subtle variant. I've featured this, the first issue of Manga's UK reprints of the Topps strips, before (see: here) but, it turns out, that was the bog-standard edition. This is a hitherto unknown (to me) fancy variant (well... it did appear in the mid-nineties) with gold ink cover. Amazingly, this was being flogged for £1.95 compared with a mere £1.25 for the normal version (posted below). I have a hunch that the badge that was mounted on the standard version had a silver version of the logo... but I can't be certain of that. The contents were identical in both. What were The X-Files Bureaus? Good question. If my memories are correct, they were dedicated sections in Forbidden Planet (and possibly another chain...?) selling the burgeoning selection of officially licensed merchandise. The New Oxford Street branch of FP had their bureau on the ground floor, adjacent to the magazine racks. That said, I don't ever remember seeing this edition. Maybe it sold fast or maybe I failed to spot the (subtle) differences with the mainstream edition. 1978: CLOSE ENCOUNTERS OF THE THIRD KIND UK Ad. 1982: BLADE RUNNER UK PRINT AD.